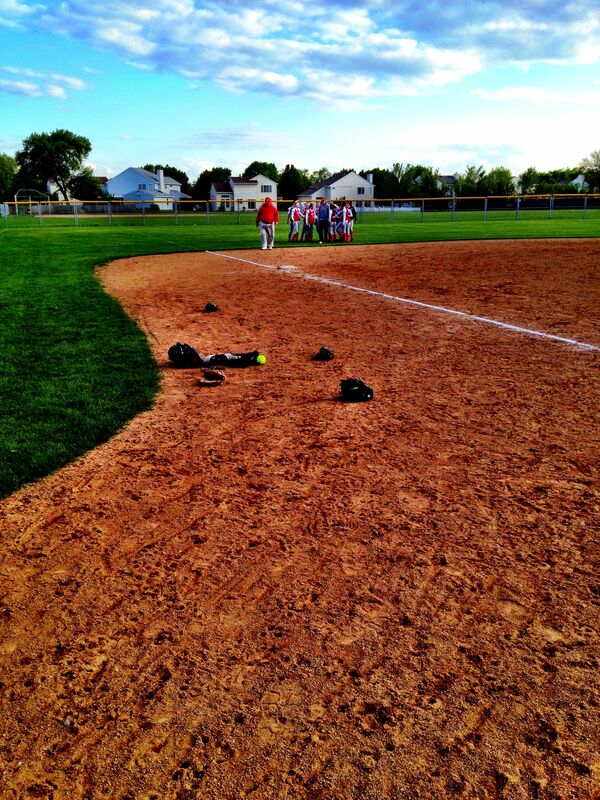 Naperville Central celebrates at home plate after winning a regional title. 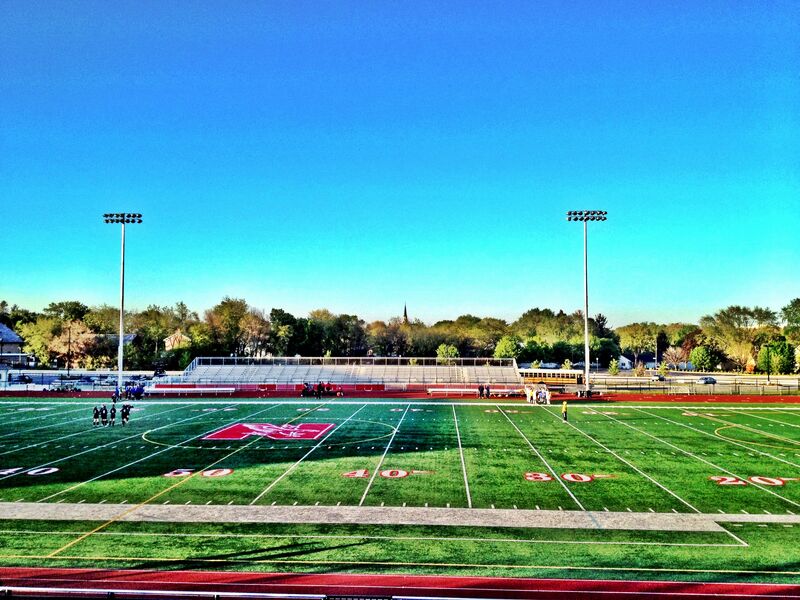 Last year, Naperville Central’s season ended with a 3-1 loss to Downers Grove South in a regional final. The Redhawks finally got revenge on Saturday, knocking off the Mustangs 5-1 in the Downers Grove South regional final. “It was great. They beat us last year. We needed to beat them this year, we couldn’t let that happen twice,” Redhawks second baseman Jeff Lucas said. Naperville Central (25-12) was led by pitcher Jim Nashert, who turned in an all-around clutch performance. The right-handed junior surrendered no earned runs while allowing four hits and three walks in seven innings of work. Nashert also helped out on offense, driving in two runs and scoring another. Naperville Central took advantage of four Downers South errors to score its first three runs. The Redhawks took a 1-0 lead in the third inning when an infield error allowed Nashert to score. After Mustangs left fielder Zach Taylor tied the game at 1-1 with an RBI single in the fourth inning, the Redhawks scored two more unearned runs in the fifth inning to retake the lead. Nashert’s RBI groundout drove in Lucas to put the Redhawks up 2-1. Two batters later, Naperville Central went up 3-1 when Kevin Linne – who reached base on an error – scored on another infield error. The Redhawks scored two insurance runs in the seventh inning, going up 5-1 on a sacrifice fly by Nashert and an RBI single by Ross Murphy. Downers South (24-13) coach Darren Orel said his team just couldn’t afford to make that many mistakes. “They’re a great team, you give them extra outs and they’re going to take advantage of it,” Orel said. Mustangs pitcher Brian Glowicki gave up just two earned runs and seven hits while striking out four and walking none in seven innings on the mound. 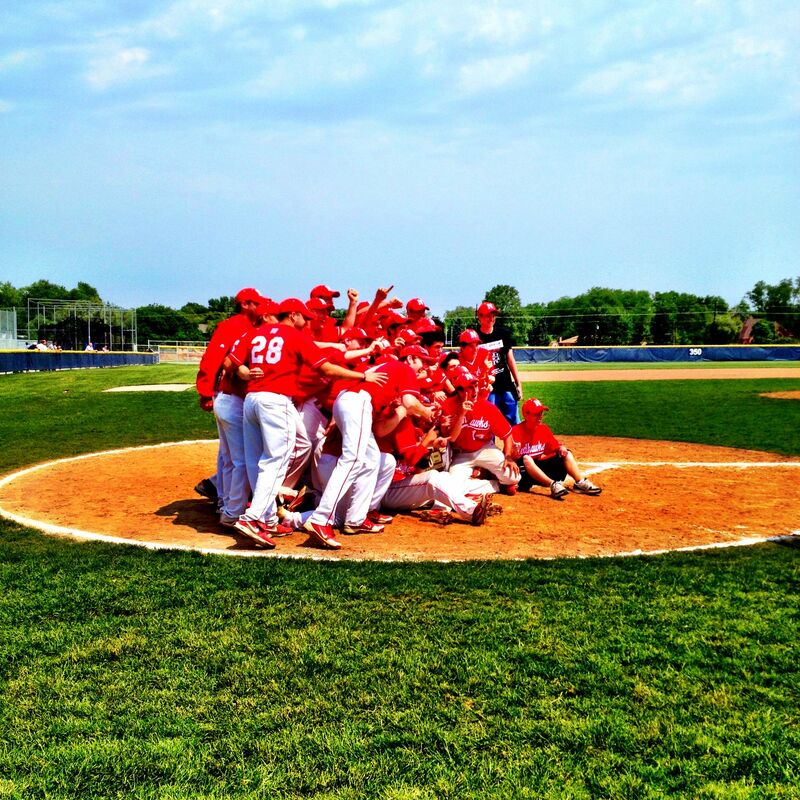 Naperville Central got a boost from the bottom of its batting order. Lucas and Linne, the No. 8 and No. 9 hitters in the Redhawks lineup, combined for three hits and four runs scored. 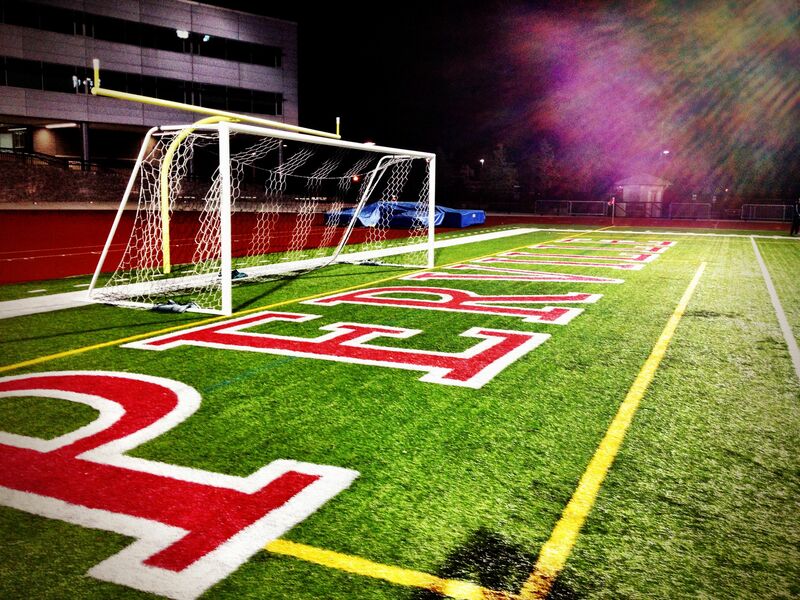 Naperville Central, the No. 5 seed in the Romeoville sectional, moves on to face No. 1 seed Plainfield North at 4:30 p.m. Wednesday in a sectional semifinal. Lucas believes the Redhawks have the talent to make a deep run in the playoffs. I wrote this story for the Chicago Sun-Times, Naperville Sun and yourseason.com. 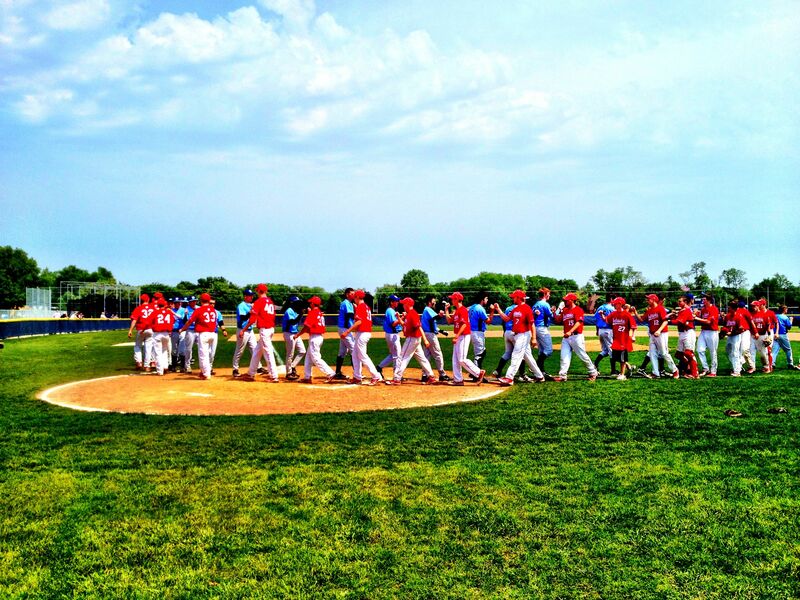 The Redhawks and Mustangs shake hands after Saturday’s game. It appears here. 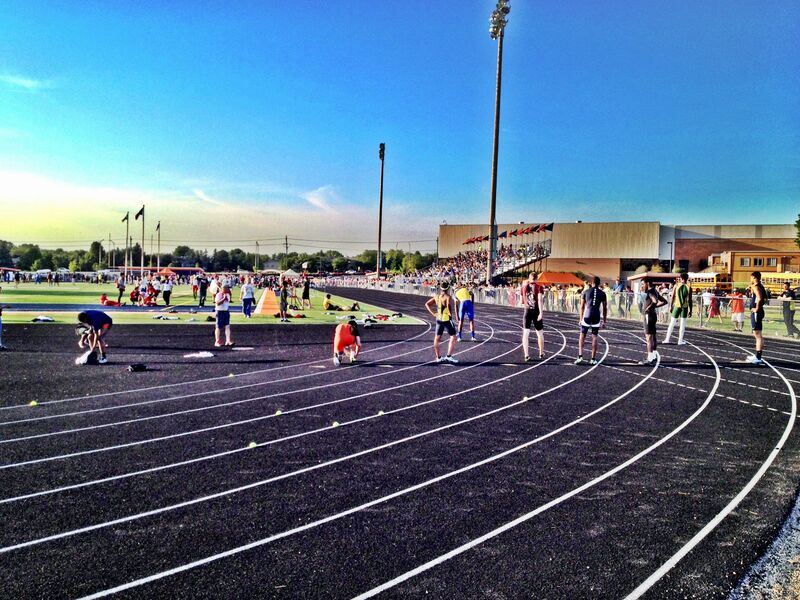 Runners get ready for the 400 relay at last week’s Naperville North sectional. When Neuqua Valley seniors Mark Derrick and Jacob Bender step onto the blue track at the boys track and field state finals in Charleston this weekend, they will be looking to improve on their top-six finishes at last year’s state meet. Both have a good shot. Derrick – who finished sixth in the 3,200 last year – comes into this year’s meet with the third best 3A qualifying time (9:12.37). And Bender – last year’s runner-up in the 400 – enters with the second highest qualifying time (48.94), just .04 seconds behind Stepfan Thelemaque of Plainfield East. The North Carolina-bound Derrick could place in two individual events. He finished first in the 1,600 at the Naperville North sectional with the 11th best 3A qualifying time (4:18.30). Derrick and the Nebraska-bound Bender are among the 20 individuals and 11 relays from local schools that will be competing at this weekend’s 118th annual boys track and field state finals. Neuqua Valley will have three other individuals competing in Charleston: Senior Taylor Soltys in the 3,200, senior Andrew Peterson in the pole vault and junior Carlos Varela-Hernandez in the discus. Varela-Hernandez – who qualified for state in the discus last year but didn’t place – will be a contender to place this weekend after having the 10th best 3A qualifying throw (164-1). The Wildcats also qualified three relays for state: The 400 team of Bender, Joseph Younis, James Sampson and Eric Metoyer, the 800 team of Younis, Nick Rafacz, Dennis Thurow and Metoyer, and the 3,200 team of Andy Martinez, Kevin Skrip, Xander Jacobson and Rolan Dewgard. Waubonsie Valley thrower Riley Kittridge has a good chance to place in both the shot put and discus. The junior placed first in both events at the Naperville North sectional with the fifth best 3A qualifying throw in the shot put (56-6) and eighth best in the discus (164-5). “My goals down there are maybe not to win, but at least get personal records and do my best,” Kittridge said. Warriors senior Jamaal Bearden also qualified in both throwing events. Waubonsie senior Kyle Schafer won the 300 hurdles at sectionals and is a contender to do the same at state. His sectional run of 38.20 was the third best 3A qualifying time, just .08 seconds behind Derrick Willies of Rock Island. Schafer also qualified for state as part of the Warriors’ 400 and 1,600 relay teams. He will be joined in the 400 by Austin Ameri, Tony Durns and Demitrius Gray and in the 1,600 by Ameri, Gray and John Burke. The Warriors’ 1,600 relay qualified for state with a time of 3:19.07, the third best mark in 3A. Waubonsie triple jumper James Travis will also be competing at state after placing first at sectionals with a jump of 44-1. 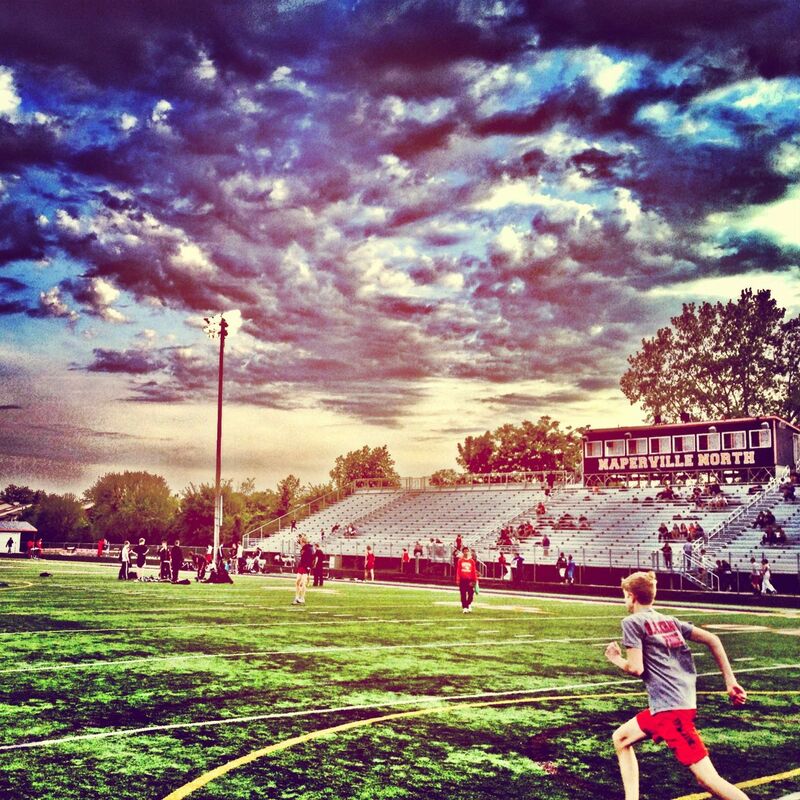 Naperville Central will be led in Charleston by its three state-qualifying relay squads: The 800 team of Brandon Lau, Tyler Haines, Kevin Kulling and Sam Bransby, the 1,600 team of Haines, Bransby, Kulling and Brad Kouchoukos and the 3,200 team of Kouchoukos, Forrest Thayer, Ethan Brodeur and Christian Schafer. 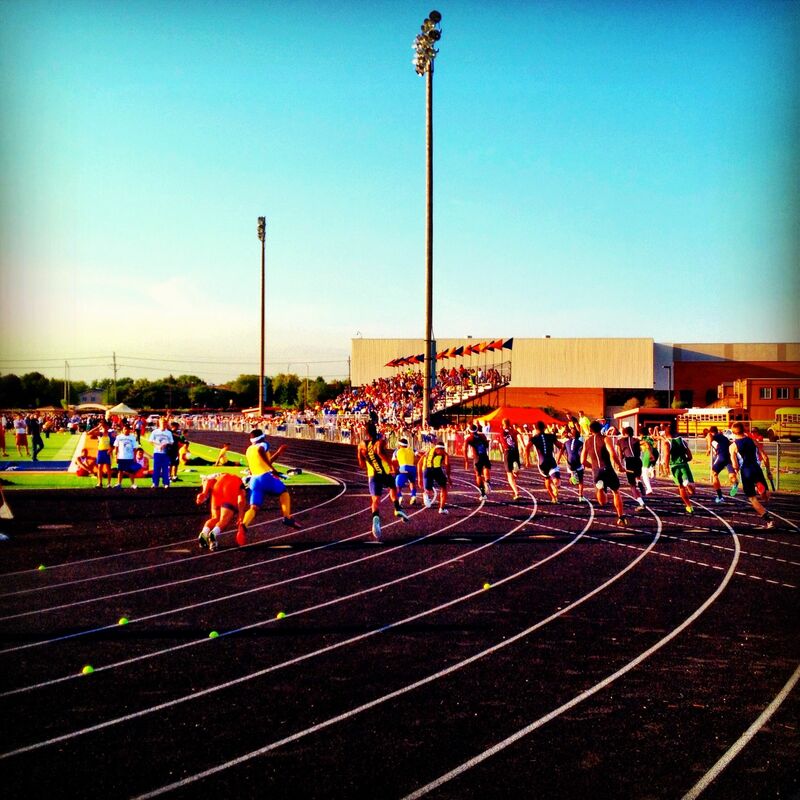 The 800 and 1,600 relays qualified for state despite entering sectionals with seed times above the state standard. “We weren’t seeded at getting any qualifying state times and we weren’t in good lanes, but we didn’t let that discourage us,” Haines said. The Redhawks also had three individuals qualify for state – Mike Juretschke and Kevin Rzepczynski in the pole vault and David Goodalis in the discus. 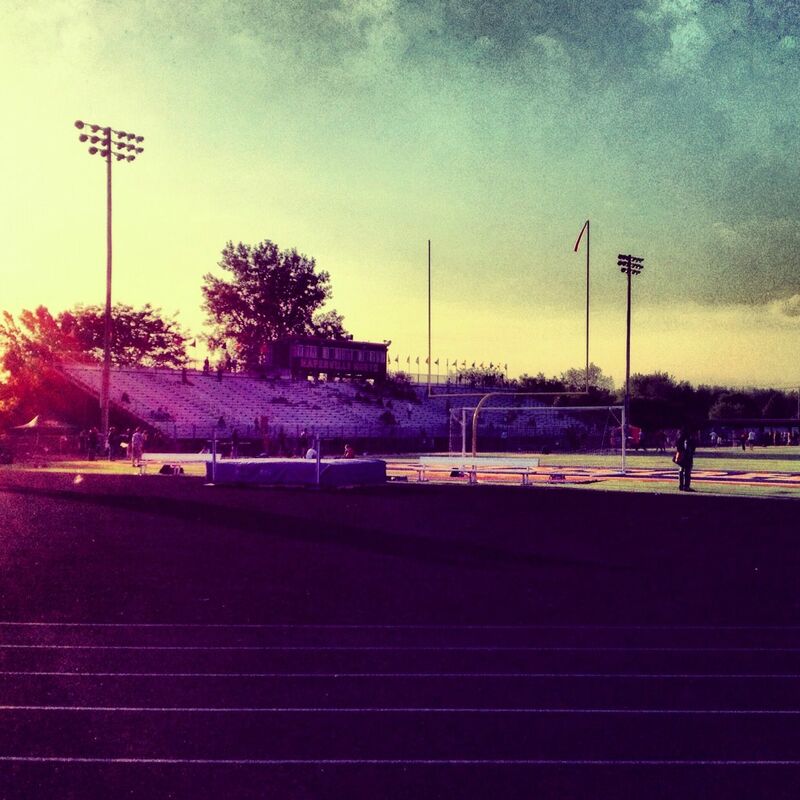 Naperville North had three individuals qualify for state – senior James Kerns in the 100 and 200, senior Nick Lyon in the pole vault and senior Kareem Midani in the long jump. Midani earned second place at sectionals by jumping 22-7.5, more than a foot farther than his previous personal best. Metea Valley had four individuals and one relay qualify out of the St. Charles North sectional. Twin brothers Joe and Matt Stewart both qualified in the 3,200. Joe won the race with a time of 9:15.27, the sixth best 3A qualifying mark, while Matt came in third (9:28.16). The Stewart twins will be joined in Charleston by junior Colin Yorke (1,600), senior Ben Hulett (300 hurdles) and 1,600 relay team of Tre’sean Mackey, Alan Williams, Aaron Laskey, and William King. Benet junior Anton Vershay qualified for the 2A state meet by finishing second at last Friday’s Lisle sectional. The Redwings’ 1,600 and 3,200 relay teams also qualified for state. I wrote this story for the Naperville Sun. It appears here. 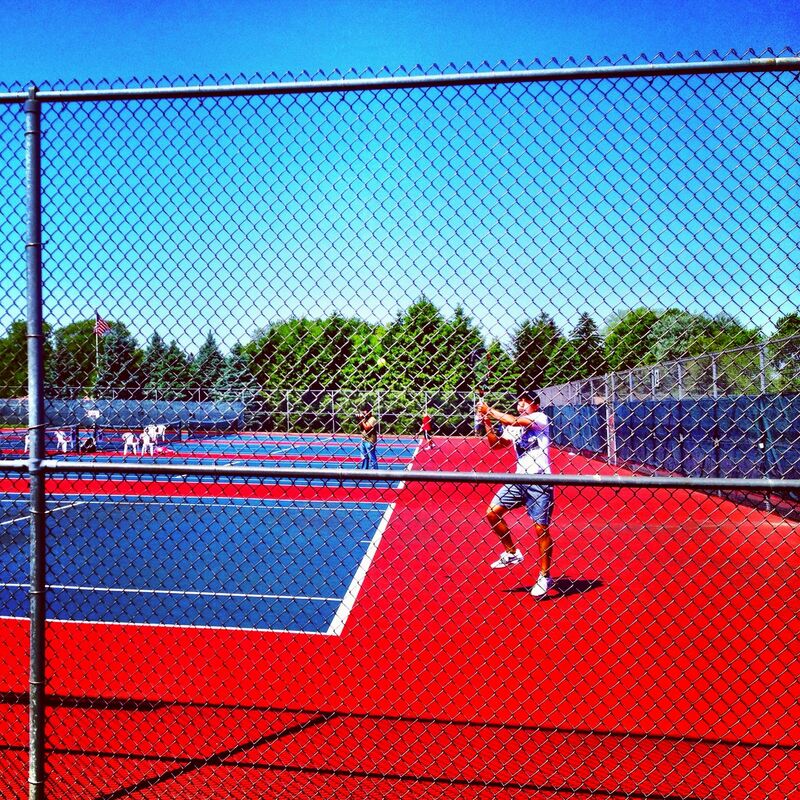 Through The Fence: Batavia’s Josh Cogan returns a serve on Saturday. Marmion continued its historic season on Saturday when two singles players and one doubles team qualified for state as the Cadets finished in first place at the West Aurora boys tennis sectional. Senior Will Graft and sophomore John Graft took second and third place respectively in singles, while the doubles team of senior Chris Pattermann and junior Jackson Rettig finished third. “The boys made history. It’s the first time in a long time, if ever, that we won a sectional title,” Cadets coach John Tsang said. The Cadets went undefeated in the regular season and were champions of the Suburban Christian Conference. Marmion topped all teams with 25 points, while Naperville Central and Waubonsie Valley tied for second with 18. Batavia (16) came in fourth. Batavia senior Josh Cogan, who tied for ninth at last year’s state tournament, knocked off Marmion’s Will Graft 6-2, 6-1 in the singles championship. Cogan, a four-time state qualifier, was able to overpower Graft with his serve. Waubonsie Valley’s senior duo of Deep Chatterjee and Abhi Singh defeated the Naperville Central team of junior Danny Albert and sophomore Wesley Lo 6-2, 5-7, 6-4 in the doubles championship. With temperatures hovering around 90 degrees, Singh said the third set was mentally and physically challenging. Singh qualified for state the previous three years in singles, but Chatterjee will be playing at state for the first time. The Redhawks’ No. 2 doubles team of Matt Mason and Justin Gillette placed fourth and will be joining Albert and Lo at state. Marmion’s Pattermann and Rettig knocked off Mason and Gillette 6-7, 7-5, 6-1 in the third place doubles match. West Aurora senior Matt Kuntzi qualified for state after a fourth-place finish. Marmion’s John Graft defeated Kuntzi 6-2, 6-4 in the third place singles match. West Aurora and Metea Valley tied for fifth place with eight points. IMSA (6), East Aurora (4) and Aurora Central (4) followed. I wrote this story for the Chicago Sun-Times, Aurora Beacon, Naperville Sun and yourseason.com. It appears here. Athletics compete in the 400 relay at Thursday’s Naperville North sectional. Minooka (80) edged Neuqua Valley (78) by just two points to take first place at Thursday’s 3A boys track sectional at Naperville North, but it was still a successful night for the Wildcats who had six individuals and three relay teams qualify for next week’s state meet. Waubonsie Valley (72.60), Plainfield North (46.60) and Joliet West (40) rounded out the top five. Naperville North and Naperville Central tied for seventh place with 31 points each. West Aurora (28) finished in eight place, Oswego East (19.60) was in 11th, Oswego (18) finished 13th and East Aurora (4) came in 16th to round out area teams. Neuqua distance runner Mark Derrick qualified for state in two events, taking first place in both the 1,600 (4:18.30) and 3,200 (9:12.37). In the 1,600, Derrick pulled ahead of Yorkville’s Chris Kellogg on the final lap to take his second title of the night. “I was a little worried for a second, then I saw that he wasn’t really putting me away, so I got myself back into the race,” Derrick said. Taylor Soltys will join Derrick at state in the 3,200 after finishing in second place. Jacob Bender qualified in both the 400 and 400 relay. However, the senior pulled in his hamstring during the 400 and was unable to participate in the 1,600 relay. 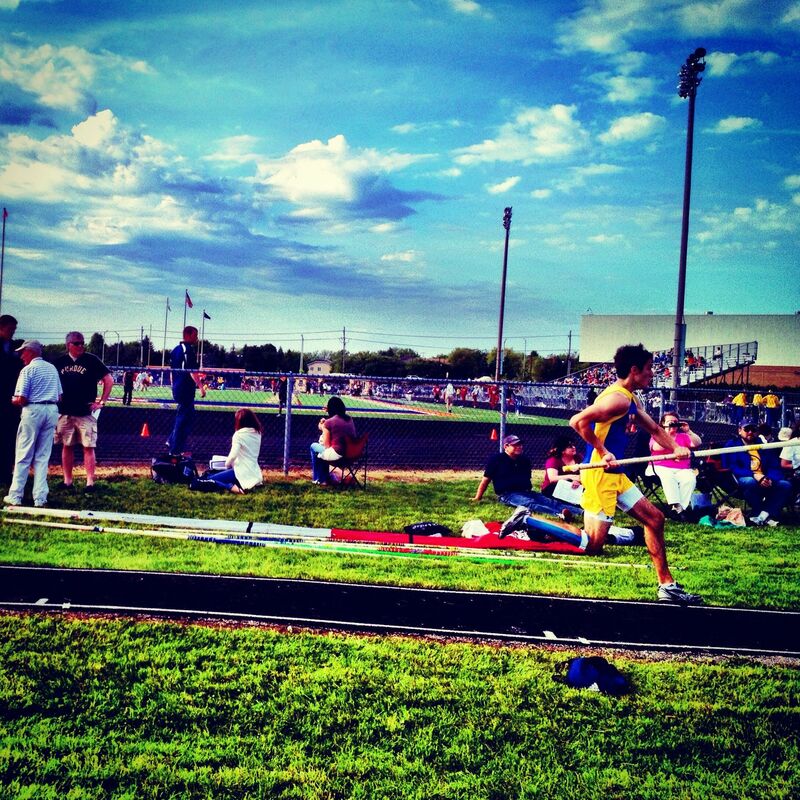 Neuqua received second place finishes Andrew Peterson in the pole vault and Carlos Varela-Hernandez in the discus. The Wildcats’ 3,200 and 800 relay teams also qualified for state. Nobody was going to out-throw Waubonsie Valley’s duo of Riley Kittridge and Jamaal Bearden on Thursday. Kittridge took home sectionals titles in both the shot put (55-3.5) and discus (164.5), while Bearden also qualified in both events, finishing second in the shot put (54-1) and third in the discus (157-3). Waubonsie had two other individuals place first – Kyle Schafer in the 300 hurdles (38.20) and James Travis in the triple jump (44-1). The Warriors’ 400 and 1600 relay teams also qualified for state. Naperville North was paced by sprinter James Kerns who qualified in both the 100 (10.97) and 200 (22.24). The senior finished second in the 100, and third in the 200 with a time exactly at the state qualifying standard. Kerns will be joined in Charleston by long jumper Kareem Midani and pole vaulter Nick Lyon. Midani set a personal record in the long jump with a leap of 22-7.5. Naperville Central will be well represented in the field at Charleston next weekend. Pole vaulters Mike Juretschke and Kevin Rzepczinski and shot putter David Goodalis all qualified for state. The Redhawks also had three relays qualify for state – the 800 team of Brandon Lau, Tyler Haines, Kevin Kulling and Sam Bransby, the 1,600 team of Haines, Bransby, Kulling and Brad Kouchoukos and the 3,200 team of Kouchoukos, Forrest Thayer, Ethan Brodeur and Christian Schafer. Hanies, a senior, got a week added to his high school career by qualifying for state in two relays. West Aurora will be represented at state by triple jumper Aaron Kennebrew and its 3,200 relay team of Calvin Robinson, Zach Truckenbrod, Vontrel Hawkins and Brandon McKay. Kennebrew overcame an injured heel to finish second in the triple jump with a leap of 43-6. Oswego East had two individuals qualify for state– Kalmon Strokes in the 300 hurdles and Chase Skenandore in the 800. The Wolves’ 3, 200 relay team of Dakoda Skenandore, Andrew Holm, Rene Salinas and Chase Skenandore also qualified. For Stokes, a senior, qualifying for state meant a four-year dream realized. Long jumper Alain Dixon was the lone qualifier for Oswego. The senior placed third (22-7), but he out-jumped the state qualifying mark 0f 22-3 by four inches. East Aurora sprinter Desmond Gant was .14 seconds away from qualifying for state in the 200. The Tomcats’ sophomore placed fourth (22.38). Wheaton North stole the show at Friday’s DuPage Valley Conference track meet at Naperville North. The Falcons won five individual championships and two relays on their way to taking first place with 175 points. Wheaton North had more than twice as many points as second-place Wheaton Warrenville South (81). Naperville Central (78), Glenbard East (71), Naperville North (65) and West Aurora (57) rounded out the top six. The Redhawks had two individual champions – Mike Juretschke in the pole vault and Sam Bransby in the 400. Juretschke, a senior, won his first outdoor DVC title by setting a personal record in the pole vault (14-3). Bransby, a sophomore, defended his DVC indoor championship in the 400 (50.09) and finished third in the 200 (22.10). The Redhawks’ 3,200 relay team of Ethan Brodeur, Christian Schafer, Brad Kouchoukos and Forrest Thayer placed second (8:01.56). Hurdler Michael Jopes placed third in both the 110 and 300 races. Central also got a third place finish from shot putter David Goodalis. Fifth-place Naperville North was paced by sprinter James Kerns. The senior finished first in a very competitive 100 with a time of 10.86. Kerns also took second place in the 200 (22.08) and ran the opening leg of the Huskies’ third-place 800 relay. Kerns had his mind set on next week’s sectional as soon as the DVC meet ended. The Huskies got third place finishes from Nick Lyon (pole vault), Kareem Midani (long jump), Nick Drendel (3200), Adam Milsap (400) and Jimmy Qiao (1600). Despite finishing sixth in the DVC, West Aurora coach Cortney Lamb saw a lot to get excited about heading into next week’s sectional meet. Aaron Kennebrew delivered the Blackhawks their only individual championship in the triple jump. The junior jumped 44 feet, 2¼ inches on his second attempt in finals, leaping almost a foot further than his previous personal best. After setting a personal record in the discus at Kane County last week, Spears did so in the shot put on Friday. The senior thrower said he’s peaking at the right time. Despite both running in the “slow heat,” Blackhawk sprinters Benny Prunty (22.28) and Tony Oros (22.82) placed fifth and sixth respectively in the 200. The Blackhawks got fourth-place finishes from Charles House in the triple jump and Josh Robinson in the 800, and fifth-place finishes from Parrish McGhee in the long jump and Omar Gomez in the 1600. Wheaton North, also champions of the indoor DVC meet in March, could not be stopped on Friday. The Falcons won seven total events and had two athletes finish in the top-six of nine individual events (100, 400, 1600, 110 hurdles, 300 hurdles, pole vault, triple jump, shot put and discus). I wrote this story for the Chicago Sun-Times, Aurora Beacon, Naperville Sun and yourseason.com. It appears here and here. 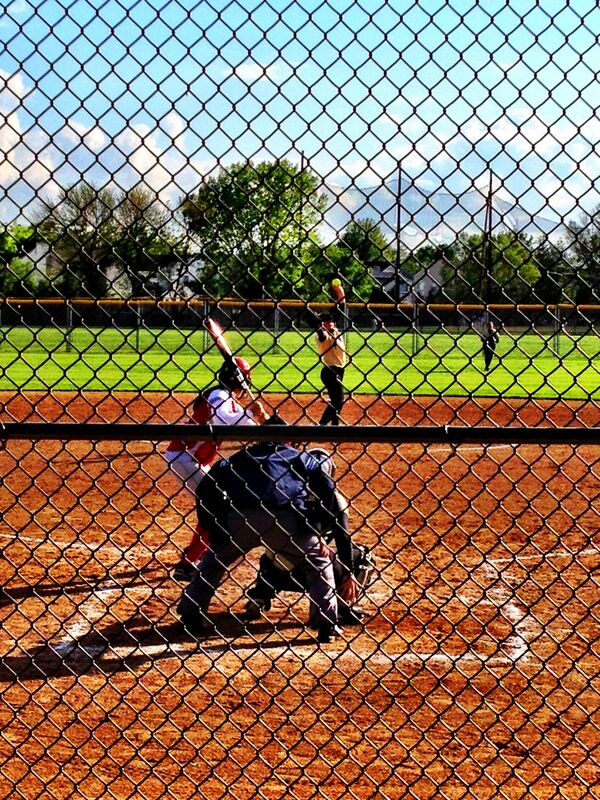 Behind The Fence: Glenbard North’s Lilly Fecho winds up on Wednesday. A team needs a special performance if it is going to beat the No. 1 ranked team in the state. That’s exactly what Naperville Central got from pitcher Keegan Hayes on Wednesday as the visiting Redhawks defeated No. 1 Glenbard North 2-1 in a DuPage Valley Conference duel. The right-handed sophomore gave up one run and four hits in seven innings of work and provided all of the Redhawks offense on a two-run home run in the fourth inning. Naperville Central improved to 21-5, 10-1. Hayes’ home run, the first of her career, came against Panthers ace Lilly Fecho. Hayes had struck out in her four previous at bats against the Purdue-bound Fecho this season and was in an 0-2 hole before launching the home run over the left-center field fence. Fecho had a chance to return the favor with the Panthers trailing 2-1 in the bottom of the seventh inning. With runners on first and second and two outs, Fecho hit a rocket to Redhawks shortstop Kelsey Gonzalez. Gonzalez made a great stop and tossed the ball over to second baseman Nicole Kappelman for the force out to end the game. Naperville Central coach Andy Nussbaum praised Gonzalez’s defense after the game. Glenbard North (25-2, 9-2) took a 1-0 lead in the first inning on an RBI double by Kelsey Muller. However, after the first inning the Panthers managed just two more hits. Fecho had another strong outing, striking out nine batters while giving up seven hits and two runs over seven innings. After starting the season 20-0, Glenbard North has lost two games in the last ten days. Panthers coach Josh Sanew said his team needs to get things going offensively again. I wrote this story for the Chicago Sun-Times, Naperville Sun and yourseason.com. It appears here. The teams take the field before Thursday’s Naperville Invitational quarterfinal. Neuqua Valley junior Gianna Dal Pozzo scored three goals in just over two minutes of second half action as the Wildcats defeated Geneva 4-2 in Thursday’s quarterfinal of the Naperville Invitational. The Wildcats move on to face undefeated Naperville North tomorrow night at Naperville Central in a semifinal of the Naperville Invitational. It took Dal Pozzo just 2:07 to tally her first-career hat-trick and for the Wildcats to take complete control of the game played at Naperville Central. With the Wilcats trailing 2-1, Dal Pozzo took a pass from sophomore forward Olivia Schmitt and scored from 10 yards out to tie the game at 2-2 with 26:42 remaining in the second half. Just 38 seconds later, Dal Pozzo gave the Wildcats a 3-2 lead with a header after receiving a perfect corner entry from junior midfielder Hope D’Addario. The junior forward capped off her two minute scoring binge with another goal assisted on by Schmitt. Dal Pozzo fired a laser from 10 yards out to put the Wildcats up 4-2 with 24:35 remaining in the second half. Dal Pozzo’s hat-trick was the Wildcats’ third straight, as Neuqua Valley forward Zoey Goralski scored three goals in back-to-back games coming into Thursday. Goralski scored the Wildcats’ first goal of Thursday’s game just two minutes into the second half. The junior tied the game at 1-1 when she unleashed a shot from the far right corner of the field that went through the fingertips of Geneva keeper Marissa Schroyer and into the back of the net. Neuqua Valley (13-3-2) and Geneva (11-3-4) played to a 1-1 tie in Geneva on Apr. 12. Wildcats coach Joe Moreau credited his team’s quick, aggressive style of play for the change in result. Geneva senior Catherine Allon scored both of the Vikings’ goals. Allon’s first goal came off a pass from junior Amanda Lulek late in the first half, and the Vikings went into halftime up 1-0 despite being out-shot 14-6 in the first half. Eight minutes into the second half, the Xavier-bound senior rocketed a shot that caromed off the top goal post and into the net, giving the Vikings a 2-1 lead.